We have many blessings for which to be thankful at the Nebraska College of Technical Agriculture in Curtis. In addition to the academic priorities for our Aggie students, the fall semester has provided a myriad of opportunities, friendships, challenges, social activities and new experiences to enhance their campus life. I am grateful to each student who has chosen to make NCTA their choice of college. The campus abounds with their enthusiasm! For some, this will be their last semester in completing their associate of science program. Following their Thanksgiving break, Aggies will have just two weeks of classes and then take finals by Dec. 13. Whether students are finishing their NCTA career soon, or planning three or more semesters with us, I appreciate their dedication to academics and valuing a successful program at NCTA. This week of Thanksgiving, as visitors and our campus community enter the main lobby of the Nebraska Agriculture Industry Education Center, they can’t help but notice a colorful display emblazoned upon the glass panels of the Welcome Center. Although the Thanksgiving Tom Turkey is one-dimensional, the artistic visual symbolizes a fun activity that many of us have enjoyed this month with a “Countdown to Kindness” theme leading up to Thanksgiving. 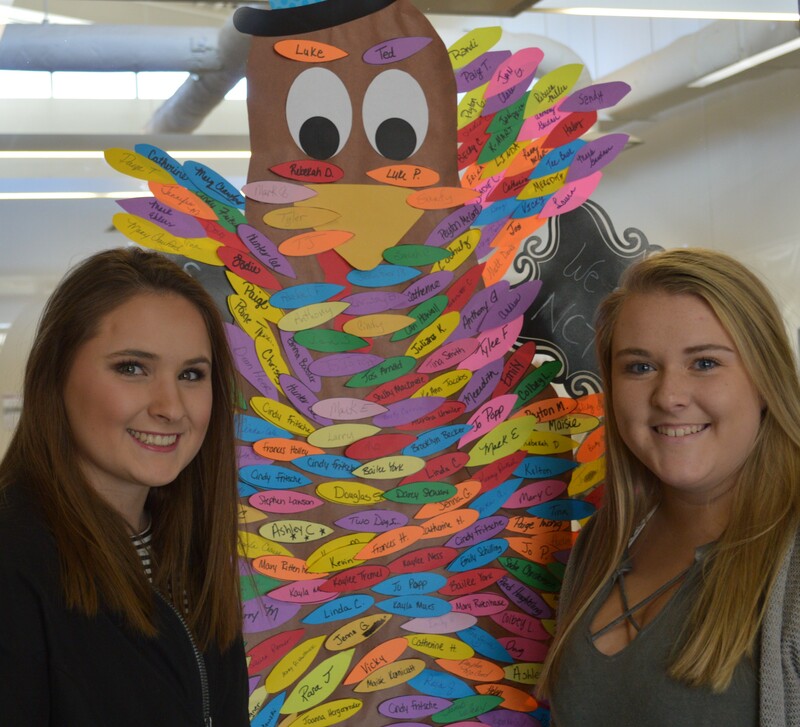 When witnessing an act or gesture of kindness around campus, staff and faculty took note and gave the student or campus recipient a feather to help decorate the turkey. By Thanksgiving, the bird looked fairly well covered with colorful feathers. Aggies shared more smiles, opened doors for each other, helped clear off dining areas after meals, and donated supplies to the Frontier County Food Pantry. Thank you to each person who participated in sharing greater kindness – perhaps random or quite intentional – and to those who recognized and appreciated the gesture. The format enlivened our daily routines and created a stronger sense of community around campus. A special note of appreciation goes to three groups of employees who keep our campus in a constant state of readiness and community service. The NCTA Food Service, Custodial and Security, and Maintenance Departments at the college perform much of their work behind the scenes. However, our campus literally would not be able to operate around the clock without these dedicated teams of supervisors and employees. Cindy Fritsche, Sarah Cole and four fulltime and several part-time employees keep students, campus community and often public groups, served nutritional meals. They prepare all of the food for three meals daily, Monday-Friday, at the Aggie Dining cafeteria, as well as service for the deli, Chandie’s Castle. And, they also serve large groups such 300-400 during district FFA events, for example, which are in addition to regular food services. Becky Currie and five custodial and security team employees clean all of the campus buildings and public access sites, including facility preparation for campus activities (such as the large group events). During summer months, they also assist in deep cleaning the residence halls and updates in painting, and waxing all of the floors in buildings. Kenny Russell, Mark Ehlers and Anthony Gardner, plus three part-time/temporary employees handle exterior and interior repairs and updates to facilities, along with equipment and the heating and cooling systems through the wood chip energy plant on campus. Randi Houghtelling heads the facilities and custodial schedules and work orders, as an integral part of the NCTA Business Office. All of us at NCTA are grateful to these three teams of valued employees. The Curtis community and Aggie campus is fortunate for the dedication of every person at NCTA, where we are a small campus and tight-knit Aggie family who appreciate the history and traditions of this 105-year-old institution. From Dean Rosati, Associate Dean McConville, our NCTA family and students, we wish you a happy and safe Thanksgiving! 27: NCTA Countdown to Kindness Celebration, 7 p.m.
29: Dawson County Cattlemen, Animal Science Dept.